We will be opening a little later on Sunday April 16th and offering an Easter Brunch from 11:00 AM - 4:30 PM. We will re-open at 5:00 PM for normal dinner service. 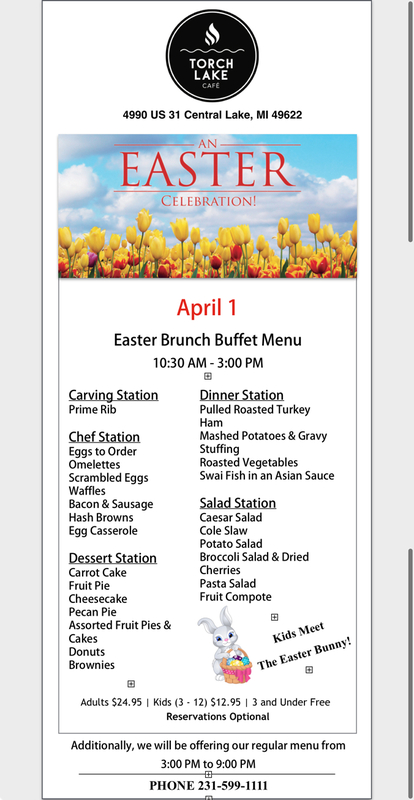 Click Easter Brunch Menu to see the menu listing. Joins us for Easter Dinner! This easter Sunday we will be featuring a honey glazed ham with baked Brussel sprouts tossed in a light olive oil, seasoned, and a baked sweet potato with a light coating of maple syrup and brown sugar. Of course, you can order from our normal menu if you prefer. So if you have a chance, please come out and see us!